January 5, 2007, Rick Smith received a phone call from the Head of Engineering at BC Place Stadium. There was a significant tear in the Teflon roof. Riggit had been working on the seal covers and ongoing roof maintenance for the previous three years. 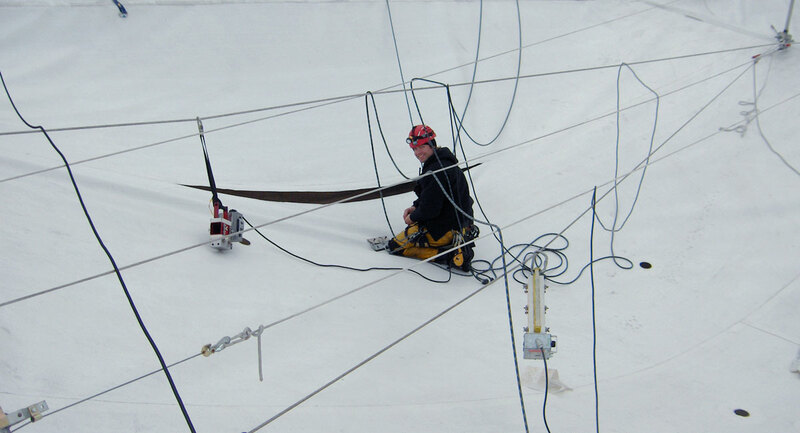 Riggit mobilized 48 riggers within 24 hours of the first phone call and began repairing the roof within 48 hours of its deflation. The rigging supplies purchased within the first 72 hours included over 85,000 feet of kermantle rope, more than 350 carabineers, 68 Petzl belay systems, 480 rated climbing slings and 8 complete Kootenay carriages. 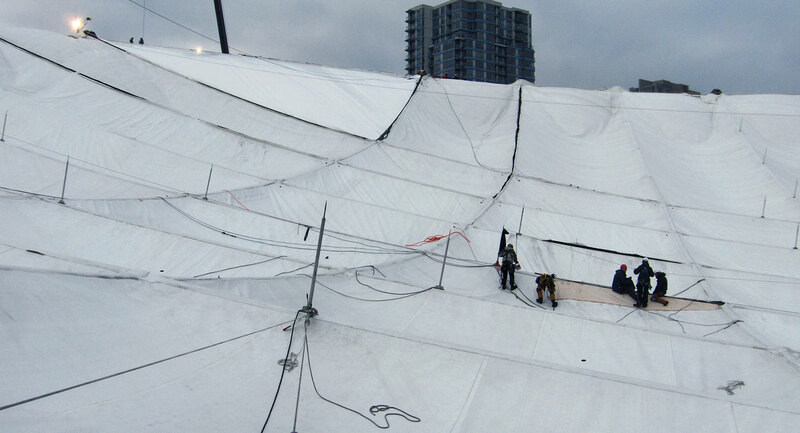 Riggit became the General Contractor at BC Place and coordinated all of the repairs that were required to re-inflate the dome. 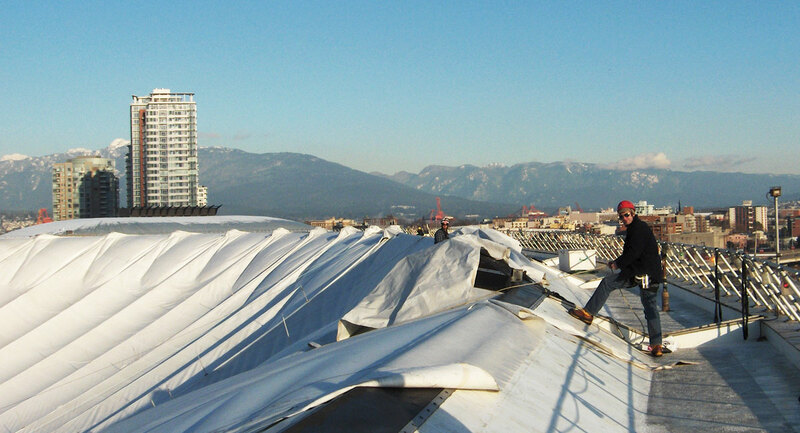 This was one of the most technically demanding repair procedures ever undertaken in an air supported dome. The first priority was to gain access into the now inverted dome. 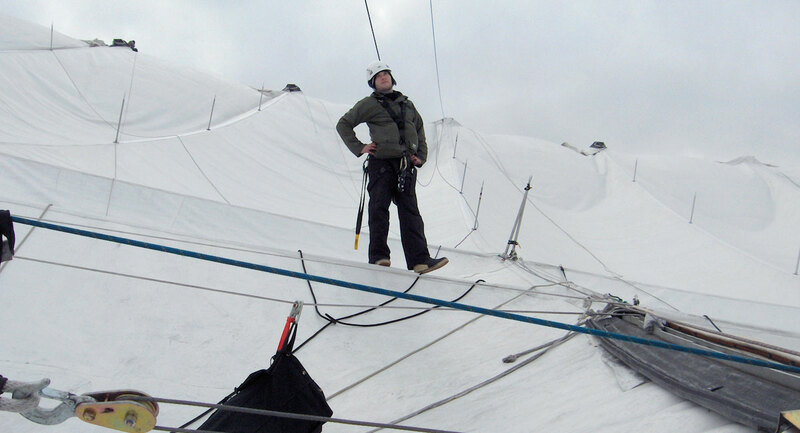 This required a highly skilled team of high angle riggers, climbers and technicians. It was determined that a highline Kootenay carriage rescue system would be required to span over 1100 feet across the ring beam. 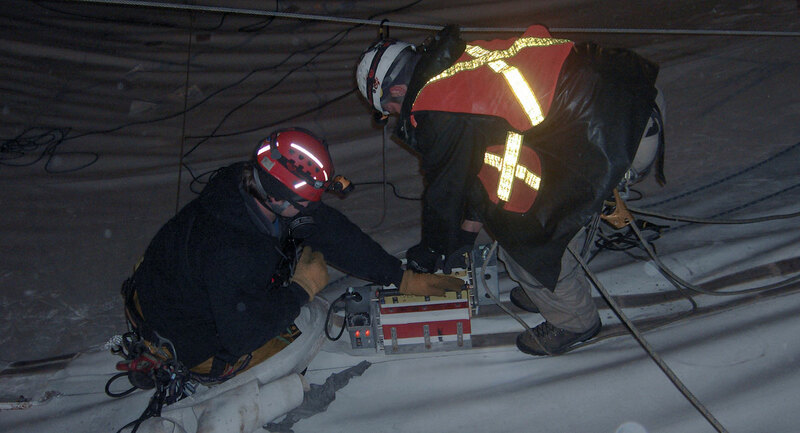 The High Angle Rescue Team from the Vancouver Fire Search and Rescue was contracted as they were the only local supplier of the 1200 foot, ½ inch diameter rope that was required to span the opening. 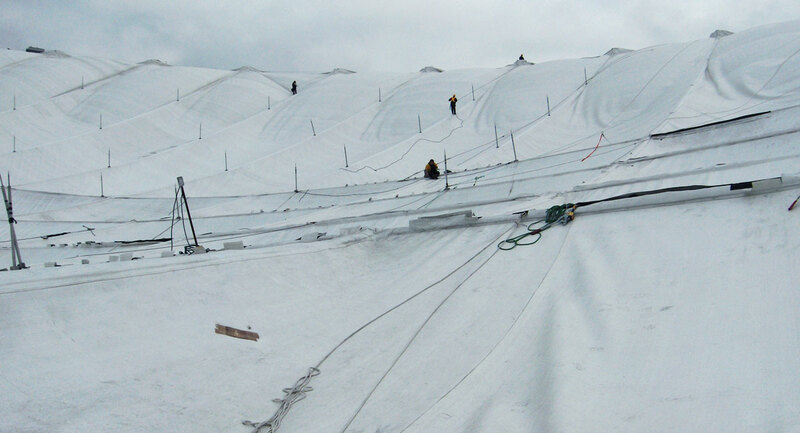 Our riggers worked in conjunction with the High Angle Rescue Team to secure and rig the line that would allow the first rigger to descend into the dome and begin the process of removing drain plugs in the roof panels to drain the large pools of water that were collecting in the over 10 acres of deflated roof material. The scale of the operation was at times overwhelming, as the crew endured every possible weather condition. We worked through snow, gale force winds, rain and freezing temperatures. As the project proceeded, additional damage was discovered daily and the scope of work had to be redefined. Riggit crews worked as much as 15 to 20 hours a day for 15 straight days with one goal: to put BC Place back in business. 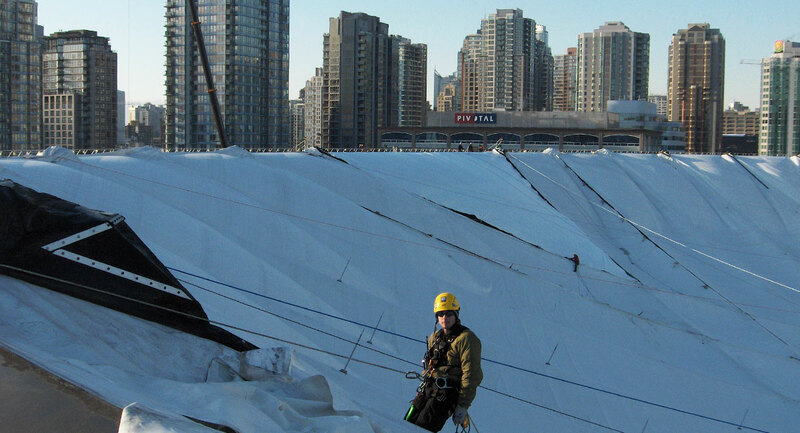 Not a single worker was injured during the repairs on BC Place which, given the extent of the challenges they faced, is amazing. Riggit cannot express the pride we feel in our workforce for their skill, commitment and willingness to make personal sacrifice. It was an honour to have been a part of such an incredible team. At the conclusion of the repair Riggit president, Rick Smith was presented an award from BC Place acknowledging his service to the venue.